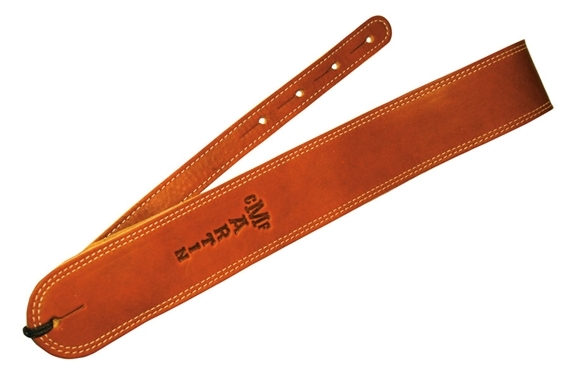 Shop Martin Ball Glove Leather Guitar Straps from AMS and enjoy Fast & Free Shipping. Give your guitar a new look with the Martin Ball Glove Leather Guitar Strap. Made from soft ‘ball glove style' leather with genuine soft sided leather underside, double detail stitching with embossed C. F. Martin logo. Strap is 2.5 inches wide. Reminds me of my baseball glove when I was a kid. Smells just like it . Comfortable and doesn't dig into my shoulder when playing extended sets. Worth every penny! It reminds me of an old leather strap my dad used to use. It’s made well and I suspect I’ll get plenty of use out of it. Not to mention how great it smells! The martin strap is a high quality product. The leather is thick and supple and looks great paired with my Martin Dreadnought Junior. I give it 5 stars for quality and workmanship. I love this strap. Supple and comfy. The notches are ideal length. Want to pick up a second. Very well made & excellent quality. As soon as it is broken in, it should feel just like my favorite ball glove did when i was a kid. Great strap made in USA!